Paging all Garena users, Blackshot, LOL (League of Legend) and HON (Heroes of Newerth) gamers, this will be something you wouldn't want to miss. 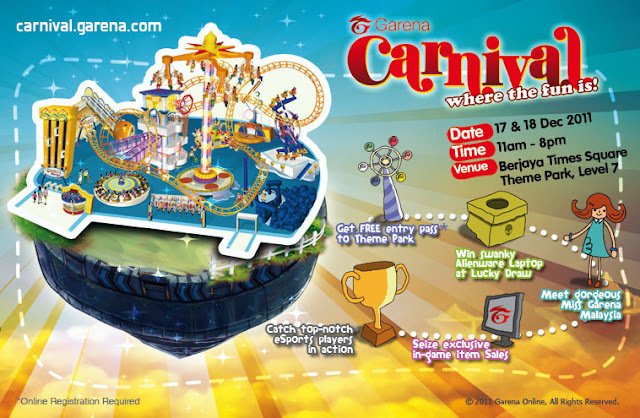 Garena Malaysia will be organising a carnival (for the very first time here) on the 17th and 18th of December, at the easily-accessible Berjaya Time Square Theme Park. As you might have guessed already, Garena will be simultaneously hosting several events during the course of the two days, including tournaments on the three games aforementioned and a beauty pagent for a chance to be named Miss Garena (wow!) Oh, and to liven your spirits even more, the champions will be congratulated with up to RM2,000 and an Alienware M14x Laptop. And for those who are simply looking for fun, all the 14 rides from both Fantasy Garden and Galaxy Station will be free of charge, unlimited.